NEW for the Fredericton Tourism blog, our guest bloggers LOVE Fredericton! Whether it's family fun, cultural exploring, nature, outdoor recreation, festival fanatics or anything in between - they want to share their passions with YOU! Interested in becoming a guest blogger? Let us know! Another long winter is slowly coming to an end. The weather is warming up, cyclists are on the trails, and you’ve probably already left the house at least once without a jacket on. This time of year usually sparks a whole new appreciation for the simple things in life. Comfortable clothing, fresh air and sunshine quickly come to mind, but so do music and art, especially here in Fredericton where the spring season means it’s finally time to Flourish. 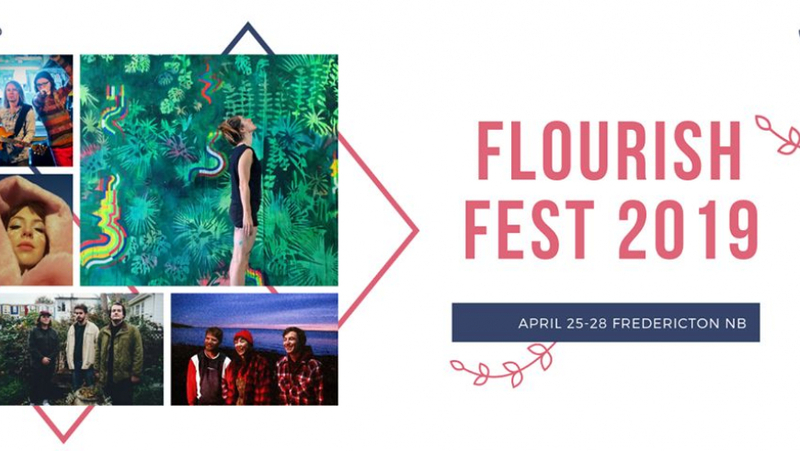 The FLOURISH Festival is an annual celebration of independent music and art that takes place each spring, animating the downtown core with an eclectic mix of sights and sounds. Pop-up stages, performances and art installations transform parts of the downtown district into a playground for artists and art lovers alike. Simply put, Flourish is an experience unlike any other. Now entering its fifth year, this festival has already earned a national reputation for its diverse programming and its art-first attitude. Music, comedy and performance art take place in both traditional and non-traditional performance venues that have each been transformed into fleeting art galleries with work by local and visiting artists filling the stages, walls and surrounding spaces. Since the inaugural festival in 2015, Flourish has been living up to its name, besting each previous year in bold and exciting ways. This year’s event will pair musicians from across Canada and parts of the United States with painters, printmakers, zine publishers, photographers, and comic, textile and sculpture artists to create the kind of unique experiences the festival has become known for. Flourish 2019 will include work by 64 artists across 36 events in 10 venues over four days. Several of this year’s events are also open to audiences of all ages and include more than just live music. There will be a Q&A with the organizers behind the Fredericton Girl’s Rock Camp and another spotlighting three locally owned and operated independent record labels. There will also be a zine and art fair and a Gallery Crawl that will include a literary variety show, storytelling, a pop-up fashion show, an improv performance and of course, live music. So, what are you doing April 25-28 or do we even need to ask? Let’s FLOURISH! Matt Carter is a husband, writer, bike enthusiast, photographer, craft beer lover, musician and first year gardener based in Fredericton. A proud Frederictonian and New Brunswicker, he founded the arts and culture website Grid City Magazine, where he does his best to share music being made and events taking place throughout the region.